I thought I would pen this little information page to help you understand how an engagement shoot with me works – you can also check out some recent engagement shoots here. I offer a complimentary hour’s engagement shoot with all my full day wedding packages booked. I like to get to know you both as a couple so my engagement shoots are very informal, which I find it helps my couples relax and means I’m not a stranger to them on their wedding day. It’s very useful for me to know how you photograph together before the big day as all couples are different – and of course on your wedding day I often have a much shorter time frame to work with so it’s great to know what works and what doesn’t beforehand! It also gives me the opportunity to find out if there are any worries you might have about being photographed. It’s also a great chance for you to see how I will work with you at your couples session on your wedding day, as during the eshoot I will briefly explain what I’m doing and why, so you know what to expect. You are not alone if you feel camera shy – most of my couples start their eshoot this way, but I have some fun techniques to help you relax and move your concentration away from me and on to each other. My absolute favourite images are where my couples have totally forgotten about me and are just interacting with each other! Beccy and Dan brought their lovely dog Evie with them to their engagement shoot, so if you have a furry friend, please feel free to bring them along! Where to have an engagement shoot? This is entirely up to you! 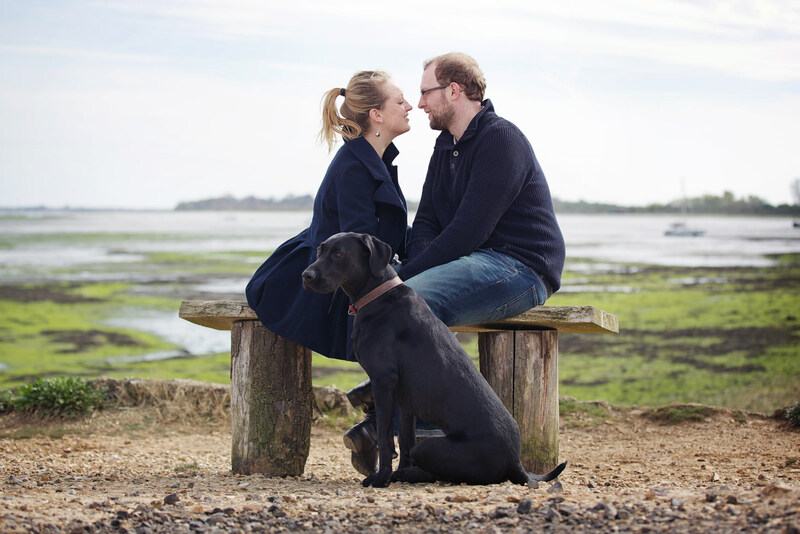 My e-shoots are complimentary up to an hour’s travel from London, but I also do them further afield too – I just charge a small additional fee to cover my travel and extra time costs. I usually ask my couples to think of any places that are meaningful to them – somewhere they like spending time together, a little pocket where they live that they consider beautiful, maybe even where they got engaged. 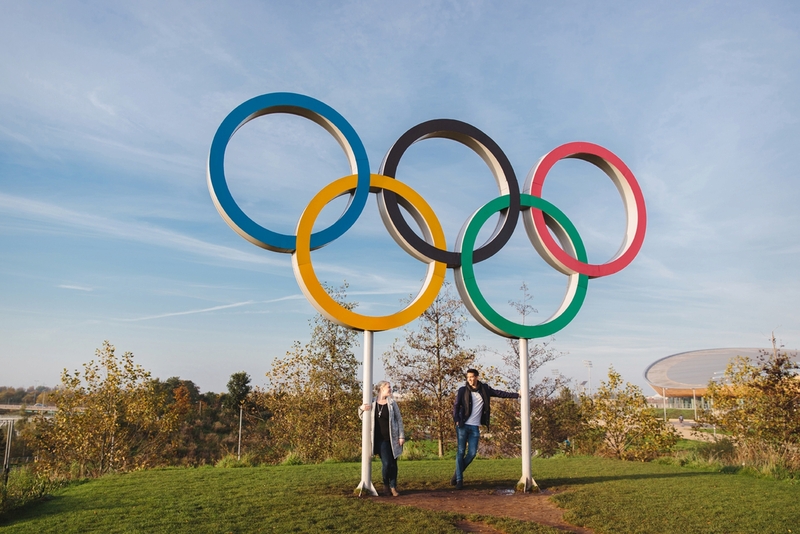 I don’t have any boundaries when it comes to engagement shoot locations – I’ve done them everywhere from in restaurants, to forests – even under the Olympic rings! The most important thing is that you as a couple are somewhere that you can be comfortable together. Don’t worry if you don’t have a location in mind – I shoot a lot of fashion and portraits around London, so I have a little list of shooting places (and even props, if you’re into smoke bombs!) that I would love to recommend. How long is the engagement shoot, and what happens on it? My actual shooting time is around an hour, or sometimes a little longer depending on location. However I don’t like to just turn up and shoot, so we can always nip to the pub for a pint of courage or cup of tea or just sit and have a quick chat before heading out to get you relaxed. My e-shoots are not very structured once at the location – we’ll go for a wander and assess the light and look out for interesting looking spots for the best images. If I’ve shot there before, I’ll point out my favourite little places to you! When to have the engagement shoot? Because I am booked up most weekends during peak wedding season (May – September), I am not always available on a Saturday or Sunday. However I always have a lot of weekday and evening availability – in fact in the summer I usually recommend weekday evening sessions – locations are generally quieter and the late summer light is just bloody fantastic! I suggested a summer evening shoot to Anwen and Stef at Virginia Water park and we ended up with gorgeous golden light and a fabulous sunset! In springtime, late autumn and winter I generally have good weekend availability. Whatever season you choose, I will send over a list of dates for you to pick from. Knowing our lovely English weather, it’s always a great idea to have a rain backup! If it’s light or intermittent rain, there are still great opportunities for shoots under cover in London, so it may just mean a simple change of location. I am always up for a a bit of fun in the rain with my flash! Of course, if it is super evil horrendous weather, I’ll send you a new list of dates to pick from, and we’ll move to another day. Rule number 1 – be comfortable! 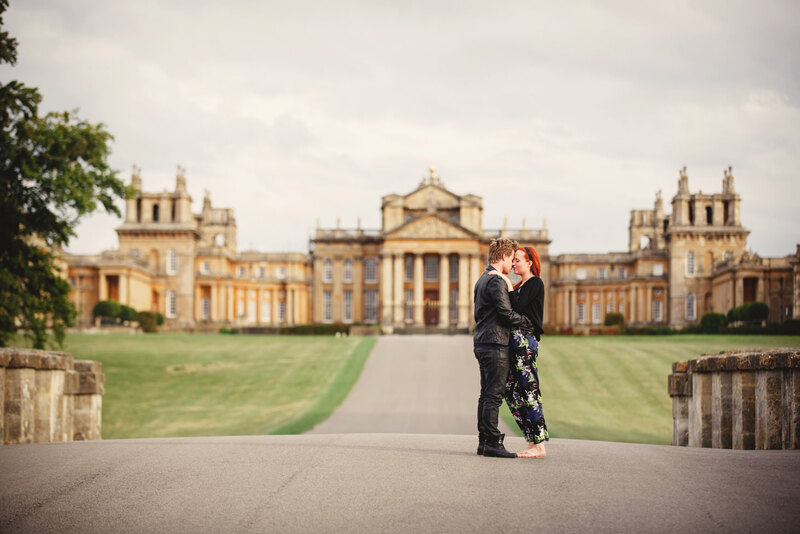 It’s likely we’ll be walking a fair bit, so please bring comfy shoes or flats – you can always change into heels if need be (in fact, I also recommend this on your wedding day, in case we have to wander a bit for couple photos). Please don’t feel you need to dress up – if you’re wearing something that you wouldn’t usually wear and feel uncomfortable, this will come across in your images. Ultimately this shoot is for and about you, so please wear whatever you feel most relaxed in. Please do dress weather appropriate though! One thing I would advise is not to wear super bright and bold colours, for example a bright pink top, because that colour is likely to reflect back up into your face. Try to stick to neutral, dark or pale light colours. 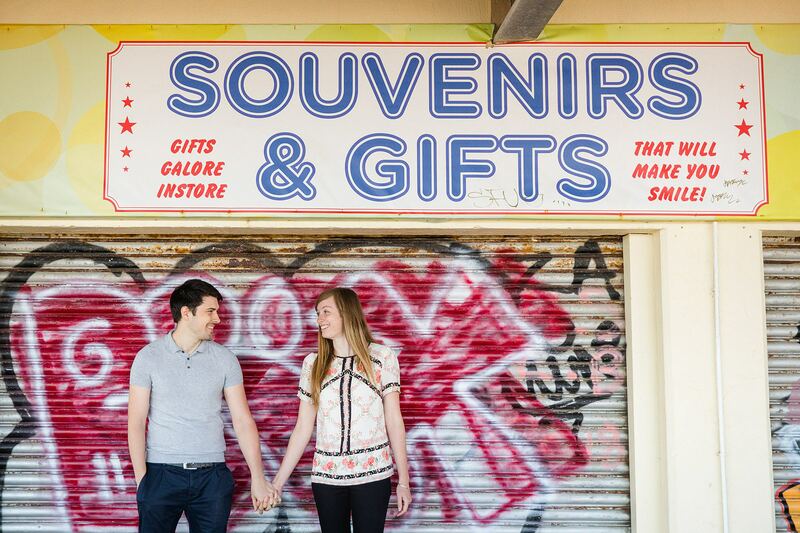 Claire and Roy had their engagement shoot in early March, so it was still cold, but they still look fabulous! As with your wedding photography, the number of images taken will exceed the number of images delivered, as I will select the only best ones to give you. About 2-3 weeks after the shoot, I’ll send over your edited images in an online gallery for you to download both hi res and low Facebook res versions. Please use these images however you like – save the dates, invitations, blown up on your walls, given to parents, used on guest signing books…the list is endless! Hopefully after the shoot, you will have a clearer feel of what it’s like to be photographed as a couple and so be relaxed and confident for your own wedding photography – your actual couples session will be very similar (albeit shorter!) on the day. I ask my couples at the end of their engagement shoot how they found it, and the answer is almost always the same – they were nervous at the beginning, but concentrating on each other and not me soon helped them relax. They also felt they would be far more comfortable on the day, having gotten to know me and how I work. One of the most important things for me when shooting weddings is not to have my couple feel I am a total stranger on the day! I do hope this guide has been helpful, and if you do have any further questions, please feel free to drop me a line!